Fries. Who doesn't love them? But if you're lowcarb, you probably won't eat them anymore. Or maybe you do, as your occasional cheat meal. 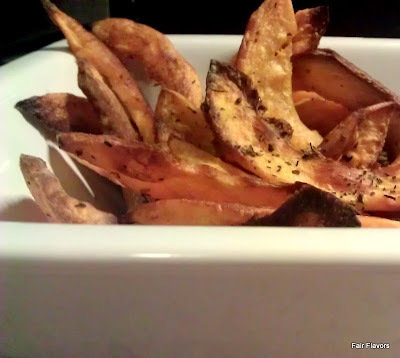 Some people swap them for the healthier sweet potato fries, but those are still heavy on carbs. Pumpkins are much lower in carbs and, as I found out today, a lovely substitute. Preheat the oven to 400F (200C). Cut the pumpkin (I used a little butternut squash) into (not too thick) pieces. Make sure they're pretty much equal in size, so they cook evenly. 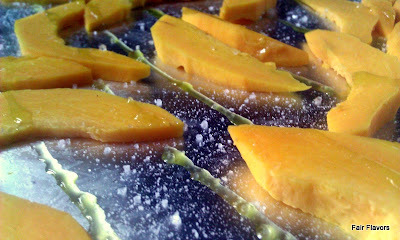 Place the pieces on a baking sheet coverd with foil. Drizzle a good amount of olive oil on top (I used about 3 tbsp for nearly a pound of pumpkin), and toss them, so every piece is covered in oil. Now it's time to season them. I used some coarse sea salt and a sprinkle of dried mixed Italian herbs. But you can use anything you like. Cumin, coriander, garlic...to name a few. Place the baking sheet in the hot oven and bake for about 15 minutes. Toss them again, and bake for about 15 more. Keep an eye on them, it depends on the thickness of the pieces how long it takes to bake them. I kept them fairly thin, so 30 minutes was more than enough. Just look at them and feel. If the edges are browning and feel crisp, they're almost done. If they're completely brown, you probably overcooked them. They were lovely with a generous serving of garlic mayonnaise. Even the boyfriend, who wasn't very hopeful (he's not a big pumpkin fan), was pleasantly surprised and sad that I didn't make some more. Oh, these look fabulous, Anna! Can't wait to try them. I really miss fries.